Stretch ceilings are like dropped ceilings in that they sit below the regular structural ceiling within a room. A stretch ceiling is typically made of polyvinyl chloride (PVC) which is “stretched” across an area and then held in place with a frame known as a “perimeter profile”. The perimeter profile itself can be curved and shaped as needed. It can also be painted or coloured to suit any requirement or taste. As a result, they provide plenty of freedom when it comes to colour, lighting, and shape. A stretched ceiling provides much of the same advantages as dropped ceilings. They can help to cover up the poor condition of the existing ceiling and cover wires, ducts, and pipes. Stretch ceilings are commonly used with music rooms and home theaters to improve acoustics and add soundproofing. 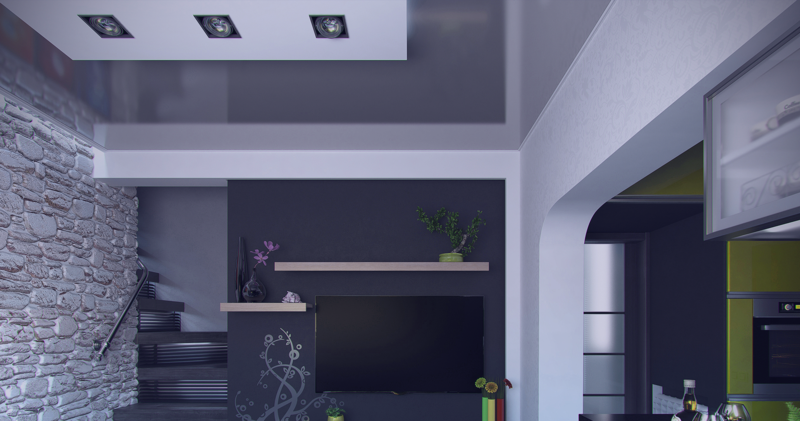 These ceilings can also be installed much faster than most other ceiling finishes available. Stretch ceilings are typically made from a non-flammable PVC membrane that is attached to an aluminium railing called a “perimeter profile”. The PVC can be finished with gloss paint and printed/painted with patterns and images. This is why they are popular with stores and displays. The PVC membrane is made from several sheets joined together. Be sure to check the quality of joints before making a purchase. The first step of installing a stretch ceiling is to fit tracks to the interior of a room. The PVC sheets are attached to the tracks and then tightened with heat. Stretched ceilings offer all of the benefits of a drop ceiling. They can be installed to look like flat ceilings and they can also be manipulated into shapes including arches, domes, and organic 3D shapes that aren’t possible with the grid-and-tyle system of a dropped ceiling. The PVC of the ceiling can also be removed for easy dry cleaning.